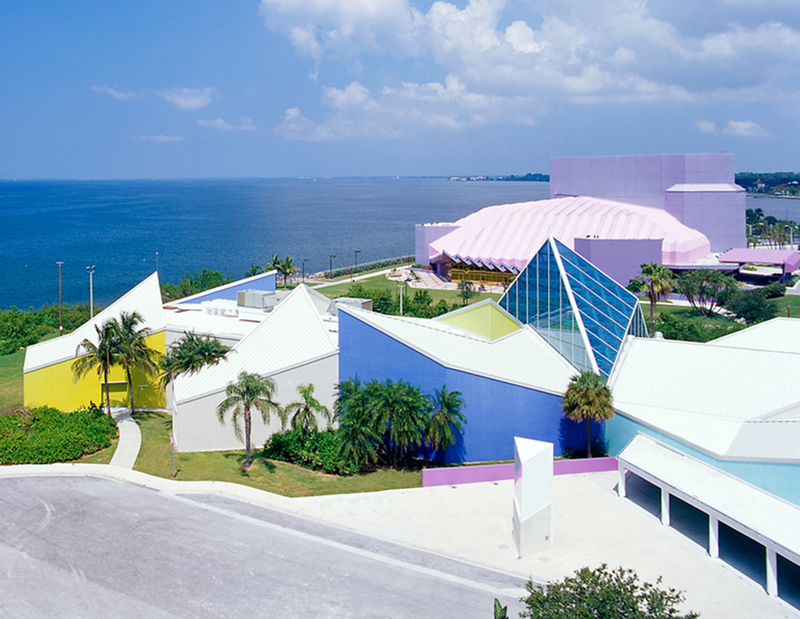 A Walter Netsch–designed library is under threat as plans move forward for a much-anticipated, community-backed bayfront development in Sarasota, Florida. On Thursday, September 6, the city’s planning board voted 3-2 to approve phase 1 of The Bay project, a 53-acre recreational and cultural complex which indirectly calls for the demolition of the old Selby Public Library building. According to Sarasota Vice-Mayor Jen Ahearn-Koch, zero consideration was given to the fate of the 30,000-square-foot structure despite other historic buildings being saved on site. “My biggest issue with this is that the proper process isn’t being taken to determine the library’s future,” she said. “Why is the first step of creating this legacy project destroying a former legacy project?” The Selby Public Library, designed under Netsch's lead at Skidmore, Owings & Merrill in 1976, sits on an underutilized waterfront plot that’s been eyed for large-scale development for over a decade. The building, now known as the G.Wiz Science Museum, has been empty for six years and costs the city $40,000 annually to maintain. Ahearn-Koch and other G.Wiz advocates claimed that leading up to an early September special planning meeting, neither the city nor the public had been officially notified of the decision to take the building down. She also said the Sarasota Bayfront Planning Organization (SBPO), which is spearheading the effort, did not provide sufficient evidence for the $10.5-million cost the group estimated that it would take to rehabilitate the 42-year-old structure. The SBPO only provided a presentation with pictures of the proposal, which did not include the G.Wiz building. “Before you talk about why you can’t save a building and repurpose it, you have to discuss the historical and cultural value of it and then figure out how much it will cost,” Ahearn-Koch said. Following the SBPO’s presentation, locals took over the two-hour comment period citing concerns over G.Wiz. According to Ahearn-Koch, the city received countless emails calling for its preservation, but the SBPO team claimed they never received any pleas to save it prior to the meeting. Now the group says it will welcome ideas on how to reuse the building as part of The Bay. Sarasota boasts a rich architectural legacy and a burgeoning development scene that often gets overshadowed by mega-projects nearby in Miami. The Sarasota School of Architecture includes an incredible roster of modernist buildings by architects such as Paul Rudolph, William Rupp, Mark Hampton, and Ralph Twitchell. According to Vassar College Professor of Art Nick Adams, Netsch’s Selby Public Library, while not widely known compared to Netch's other projects, is a pure demonstration of "field theory," the late architect’s approach to designing architecture around unique geometries suited to the program and environment. “It’s not a building that’s very well-covered in Netsch literature,” said Adams. “But it’s quite ingenious how the shapes of the building have a residence within the location that’s very attractive. There aren’t very many field theory buildings that are still active in their original function. I do hope before they swing the wrecking ball that the city does a proper recording of what was there and what changes were done.” Local architect Dale Parks completed an award-winning retrofit of the library in 2000, transforming it into G.Wiz and adding a soaring glass atrium to Netsch’s design. Parks believes his work didn’t inherently warp the SOM building’s original character. As an expert on the structure, he outright denies any claims that it did. “We tried to respect SOM’s construction as much as possible, and I know it would be quite easy to restore it,” Parks said. “Whatever repurpose it may have in the future, it’s definitely not going to be a library because the layout doesn’t pertain to future use. But the outside of the building is still there.” The top arguments for taking down the building are that it doesn’t stand up to current FEMA standards and would need to be significantly elevated, and that the city is spending too much money on its upkeep as tenants have shied away from staking claim to it over the past several years. Commissioner Hagen Brody, who voted yes to approve phase 1 of The Bay in favor of demolishing G.Wiz, recognizes its importance but believes removing it from the site will serve a greater good. “The community overwhelmingly wanted green space, not buildings or redevelopment on that site,” he said. "With all of that, the choice was pretty clear. A vote against moving forward with phase 1 would have sent the whole project back to the drawing board after years of public input and would have seriously jeopardized the entire effort as well as fundraising. I believe these are tough decisions, but it’s a positive change for Sarasota and that’s the definition of progress.” The initial build out of The Bay, led by a nearly all-female team from Boston-based planning firm Sasaki, would turn 10 acres of the site’s southern portion into a new public park by 2020. After being selected for the project last October, the team has worked with the SBPO and held an exhaustive community engagement process to shape the final master plan, first revealed in May and updated Friday. Susannah Ross, Gina Ford, and Christine Dunn conceived a grand park and cultural community less than a mile away from Sarasota’s beloved Boulevard of the Arts. One of the structures on the site, the lavender-colored Van Wezel Performing Arts Hall designed by Taliesin Associated Architects in 1969, is included in Sasaki’s latest renderings, only after a major public outcry occurred over its absence in the initial images. Christopher Wilson, president of the Sarasota Architectural Foundation, said the specific reuse of Van Wezel isn’t clear, but it’s more or less saved. “Saving Van Wezel and not G.Wiz makes no sense,” Wilson said. “From the beginning, this building has not gotten the proper attention that it should. The excuse that it’s in the floodplain and not up to FEMA standards is not a reason to demolish it. The city is throwing around the $10 million number prematurely with incomplete evidence.” Wilson also noted there are five other aging structures on site that have been deemed part of Sarasota’s cultural zone: the Municipal Auditorium (1938), Chidsey Library (1941), Arts Center Sarasota (1949), the Sarasota Chamber of Commerce (1956), and the Garden Club of Sarasota (1959). These buildings will remain during the construction of The Bay. In a letter sent to the Sarasota Herald-Tribune last weekend, Eric Keune, design director at SOM Chicago, provided a list of five ways G.Wiz could be adapted for reuse, including making it an open-air pavilion, a co-working space, or a satellite studio for the University of Florida architecture program. The Architect’s Newspaper was sent a copy of the text, though it has yet to be published. In his argument, Keune wrote that though the structure today is undoubtedly not the Selby Public Library, he believes the building, along with Netsch’s original vision, is still inside it and “only needs to be (re) discovered.” Vice-Mayor Ahearn-Koch feels the same way. For her, this fight is personal and she thinks people need to act fast, as Keune did, if they have ideas. "All too often in this city we do demolition by neglect and this is a perfect example of that," she said. "This is such a stunning building. I remember going to the big stack as a student, checking out a book and going off into one of the side nooks to read. I still feel this can be a very useful building for the future of Sarasota. Our arts community, including our architecture, is who we are, and I just don't see the logic in destroying it." Sarasota's Historic Preservation Board voted unanimously to recommend the SBPO and city commission find a new tenant for G.Wiz, pursue alternative renovation plans, as well as host more community workshops as phase 1 plans move forward. This is the third time in two years the advisory group has advocated for the building. For the third year in a row, manufacturer Boston Valley Terra Cotta (BVTC) and the University at Buffalo School of Architecture and Planning (UB/a+p) in upstate New York hosted the Architectural Ceramics Assemblies Workshop (ACAW). 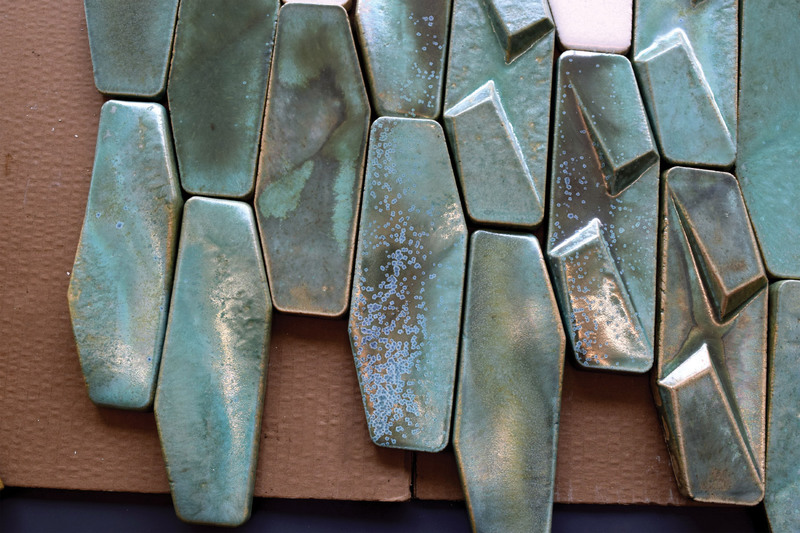 The weeklong event is a gathering of architects, engineers, and artists and offers a fast-paced opportunity for attendees to get their hands dirty physically testing the capabilities of terra-cotta design. Other sponsors of the gathering include Western New York’s Alfred University, an institution with expertise in glass and ceramics, and Rigidized Metals Corporation, a producer of deep-textured metal for exterior and interior cladding, among other products. “Architects designing with industrially produced ceramic components may have little material understanding of clay for large-scale production, while most artists trained in ceramics may have few opportunities to explore the medium at a scale beyond the individual object,” said Bill Pottle, BVTC’s Director of Business Development and organizer of the gathering. “At ACAW, architects, engineers, and educators collaborate with designers and manufacturers in order to deepen their understanding of designing with architectural terra-cotta.” BVTC was founded in 1889 as Boston Valley Pottery, a brick and clay pot manufacturing facility located on the outskirts of Buffalo, New York. The Krouse family purchased the facility in 1981 and transformed it into a cutting-edge architectural terra-cotta factory with a global footprint. Currently, projects range from the restoration of New York’s Woolworth Building to the cladding of Morris Adjmi Architect’s 363 Broadway and Kohn Peterson Fox’s One Vanderbilt. Keynote speakers, many of them workshop attendees, included Anne Currier, a clay sculptor and professor; Dr. William M. Carty, a ceramics professor at Alfred University; Christine Jetten, a ceramics and glazing consultant; Gerd Hoenicke, Director of Pre-Construction Services at Schüco; Matthew Krissel, partner at KieranTimberlake; Craig Copeland, associate partner at Pelli Clarke Pelli Architects; and Christopher Sharples, principal at SHoP Architects. This year, over 60 attendees participated in the workshop, which emphasized the role of pre-design and research at the early stages of a design project. Both the number of attendees and the overarching objectives of the workshop have evolved since its 2016 inauguration. The first event was largely a sandbox tutorial, featuring 20 attendees learning the basics of terra-cotta production. In its second year, ACAW and its 40 attendees focused on the bioclimatic function of terra-cotta in contemporary design and the retrofitting of structures. This year, building upon their experience at previous workshops, the attendees, divided into six teams, began researching and developing their prototypes in March. Designs were submitted to BVTC prior to the conference for prefabrication. Throughout the week, the teams received technical support from both BVTC and UB/a+p. Architecture and technology have always been inextricably linked, and with technology advancing faster than ever, contemporary architects have their hands full. Massachusetts-based planning and design studio Sasaki has a new initiative to help designers strengthen their skills. 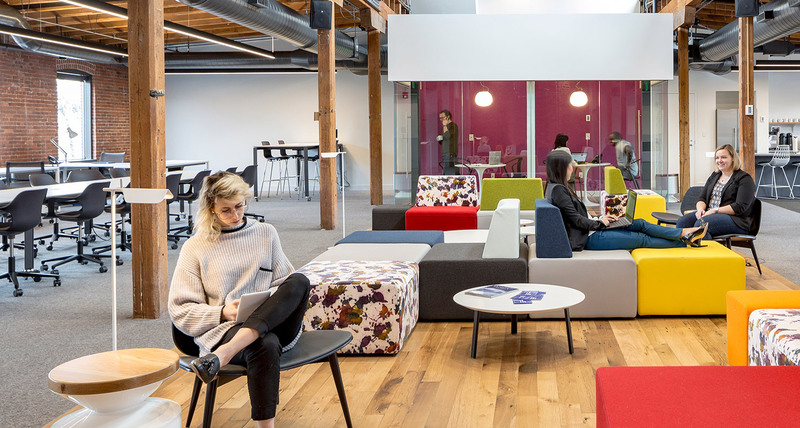 This past spring Sasaki launched an incubator program within its headquarters where tenants can directly interact with the firm's experts. The incubator includes a mix of tenants from a variety of industries, and Sasaki wants to leverage their interdisciplinary expertise to create an environment where teams can grow and cooperate. The incubator space is 5,000 square feet of both shared workspaces and research studio space. For the interiors, Sasaki chose to strip a former mill building back to the underlying structure, leaving the brick walls, wooden columns, and beams and joists exposed. The floorplan is open, though Sasaki has carved out several spaces for private meetings and conference calls. The Foundation has established a grant program for two-to-four teams on a nine-month fellowship, centered around four themes: climate innovation, transportation, accessibility, and placemaking. The incubator itself supports the aforementioned programming for grant teams and includes Sasaki as a design consultant for the those in the program. The Sasaki office and the Foundation have extended this spirit of collaboration to their second annual beyondAEC Hackathon. The Sasaki incubator will host this year’s Hackathon on July 20 and will encourage those in architecture, engineering, and construction to brainstorm solutions to real-world problems they’ve faced. The first beyondAEC Hackathon in 2017 drew 40 participants, including a handful of architecture students from local universities. Kyle and Jim Martin, inspired by engineering firm Thornton Tomasetti’s annual NYC-based hackathon, launched beyondAEC with the help of Sasaki. Kyle Martin says the hackathon provides an opportunity for local AEC practitioners to “foster a culture of design technology and push boundaries outside of their day to day practices.” Jim Martin added that they wanted to make space for “a culture of experimentation for participants to dive into and develop new ideas and learn from each other.” Sasaki will hold workshops to build up to the event through June and into July. After news broke last month that the Oakland A’s had finally settled on a site for their new ballpark at Oakland’s Peralta Community College District, their plans have been derailed after the school decided to cancel negotiations with the team. 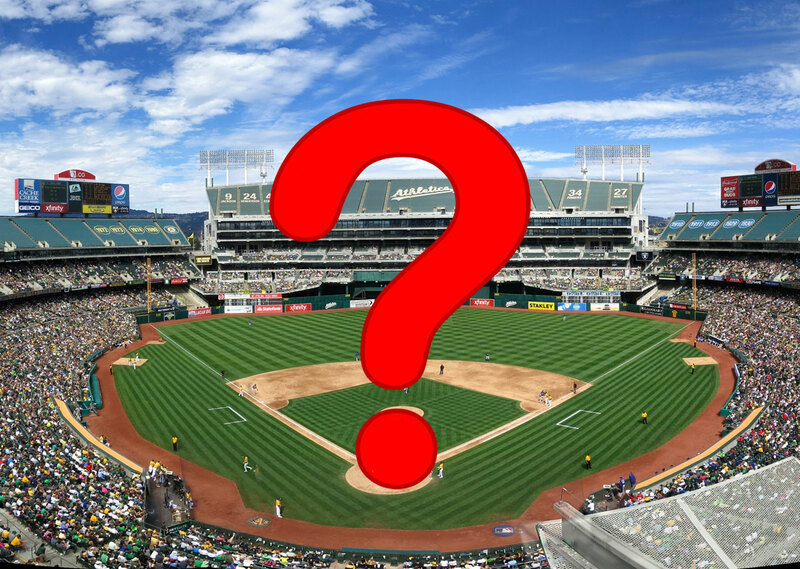 With plans for the stadium, previously to have been designed by Sasaki, Snøhetta, Studio T-Square, and HOK, now potentially derailed, it also remains to be seen if the A’s will remain in Oakland. Sasaki, Snøhetta, and Oakland-based Studio T-Square would have led master planning and urban design efforts, alongside building out a community engagement process. HOK and Snøhetta were to collaborate on the design of the new ballpark, and to make sure that it wouldn’t remain an “insular” experience. So-called “stadium districts” are becoming fairly common around the country, as team owners and designers have been seeking to jumpstart investment around areas that already experience a high amount of foot traffic. Though no renderings had been released, construction was expected to have finished by 2023. While the Peralta Community College site was chosen after a years-long search by the A’s, nothing had been finalized by their decision to put the new stadium there. Besides needing to finalize land negotiations with Peralta, the team had been facing ardent pushback from Chinatown locals worried about gentrification, from the Audubon society over the impact that development would have on bird migration patterns at the nearby Lake Merritt, and from politicians raising other concerns from their constituents. Compounding the problems the A’s were facing, much of the 15-acre site has been contaminated with an unknown amount of gasoline and other toxic substances and would have needed costly remediation. Although business leaders in Oakland had rallied in support of the investments the new stadium would generate, Peralta’s board of trustees chose to discontinue conversations with the A’s on Tuesday. “We are shocked by Peralta’s decision to not move forward,” the A’s said in a statement released this morning. “All we wanted to do was enter into a conversation about how to make this work for all of Oakland, Laney, and the Peralta Community College District. We are disappointed that we will not have that opportunity.” The A’s had already pledged to pay for development out of their own pockets, but this promise was dependent on revenue projections from a new ballpark, not the redevelopment of their existing Oakland-Alameda County Coliseum. As the only remaining professional sports team in Oakland, the pressure was on for the A’s to choose a site in the city, but with their top pick off the table, the Athletics could be enticed to leave. As A’s President Dave Kaval recently told the San Francisco Chronicle, there was no “plan B” if Peralta didn’t work out. The Oakland Athletics have finally settled on a site for their new ballpark, and have hired Sasaki, Snøhetta, Studio T-Square, and HOK to not only design the stadium, but to also better integrate it into the surrounding urban fabric. Ending years of contentious debate over where to build, the A’s have chosen the lakeside Peralta Community College District in downtown Oakland, California. Sasaki, Snøhetta, and Oakland-based Studio T-Square will lead master planning, urban design efforts, and build a community engagement process. HOK and Snøhetta will collaborate on the design of the new ballpark and how it interacts with the master plan. No images have been released as of yet, but the team and design firms involved are hoping that the new stadium will catalyze investment along Lake Merritt without alienating the community. “Our goal is to create the best ballpark experience for our fans, players, and community. It is critical for our ballpark to truly integrate into the fabric of Oakland,” said Oakland A’s President Dave Kaval, in a press release. Craig Dykers, founding partner at Snøhetta, also stressed that the project wouldn’t be an insular experience. “With its new home closer to downtown Oakland, the project will re-invigorate the relationship between the A’s and the city as a new kind of ballpark that acts as a center for sport, wellness and culture,” he said. Even with the promised outreach, community groups have been opposed to the plan owing to fears of displacement, gentrification, and potential environmental damage to the sensitive estuaries nearby. Another potential wrench in the plan is the presence of hazardous materials in the soil that would need to be remediated. An unknown amount of gasoline and other toxic substances have seeped into the ground and water at the site over the years, and no one knows how much the clean up will cost. Still, the new stadium will be a step up for the Athletics, set to become the only major league sports team in Oakland after the Raiders leave in 2019. 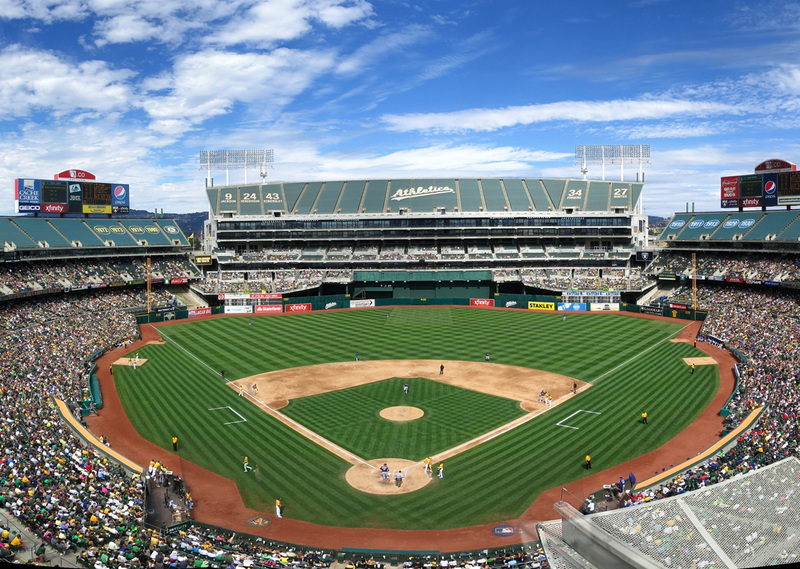 The A's current Oakland-Alameda County Coliseum is a 51-year-old concrete eyesore that the team currently shares with the Raiders, and that regularly floods with sewage when the plumbing backs up. The team claims that the new stadium will be privately funded and put up to $3.05 billion into the local economy, and that construction should finish in 2023. Downtown Houston released an ambitious master plan on Friday, the culmination of 18 months of work and input from hundreds of stakeholders. Creating walkable streets, a five-mile green loop around the city’s core, new design guidelines and more, the 20-year plan puts an emphasis on sustainable, resilient development. A product of the Houston Downtown Management District (Downtown District), a nonprofit focused on improving the quality of life in their district, and Central Houston Inc., the proposal is a spiritual successor to Houston’s 2012 Downtown Living Initiative. Although Houston lacks zoning codes, the original Downtown Living Initiative successfully encouraged growth in the city through a series of public/private partnerships, tax rebates for construction, and reinvestments into downtown Houston’s infrastructure. Asakura Robinson and Sasaki had consulting roles in the process, while HKS Architects and Harris Kornberg Architects were among the architecture firms involved in the plan's leadership group. With the new plan’s release in the wake of Hurricane Harvey, planners, designers and city officials have also turned their focus towards disaster mitigation. Besides increasing the amount of green space in the district, the proposal has set aside land for detention areas and has tried to shift away from car-dominated urban planning. City officials are expecting a population boom from 7,500 to 30,000 over the next 20 years, and are calling for the construction of 12,000 new residential units to deal with the demand. Along with building more schools and predicting a 20 percent increase in the workforce, the plan calls for keeping residential developments centralized and integrated with mass transit. As with the plan that preceded this one, questions over how affordable these developments would be have yet to be answered. Bob Eury, president of Central Houston Inc, spoke to the Houston Chronicle about the challenges involved with bringing affordable housing to this type of development. "Unless we can find public land so you can basically write off the land costs, it's extremely challenging to build affordable high-density housing without a continuous subsidy," he said. 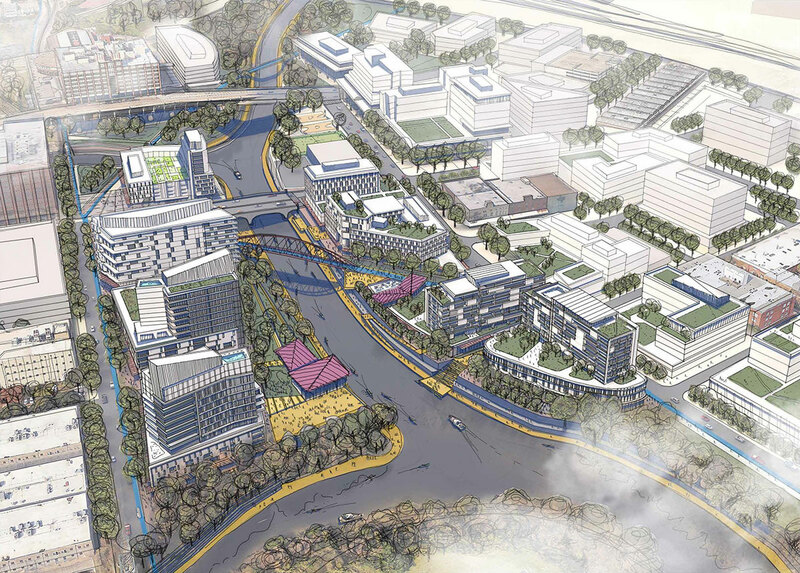 The project’s crowning jewel is its five-mile long Green Loop, a band of parks and bike lanes that would wrap the downtown area and connect it with further-flung neighborhoods. Aided by the ongoing North Houston Highway Improvement Project, a highway readjustment by the Texas Department of Transportation, downtown Houston has an unprecedented chance to readjust its urban borders. The complete Plan Downtown: Converging Culture, Lifestyle & Commerce presentation is available here. Technology and big data go hand-in-hand and Boston-based firm Sasaki is one of the firms leading the way. Sasaki's work touches on economic activity, master planning, urban regeneration, and resiliency. Big data is crucial for such work. Brad Barnett is a director of strategies at Sasaki. Within this position, his role includes city planning, designing, and data visualization as well as engaging designers with people that he described to The Architect's Newspaper (AN) as being "from the pure technology side." "Cities so far have been inert objects," said Barnett. "They are built to be offices and dwellings. We are looking at them being multi-layered." Barnett continued to explain how society is evolving to cater to technology at varying levels. Sensors can help you park your car, but they can also be used to monitor pedestrian flow within the built environment. The latter is being looked into by Sasaki with traffic signals that can analyze car traffic in Boston. An example of big data in use can be seen with Sasaki's work in the city of Houston where Sasaki is using data from Yelp! to aid the city's understanding the downtown districts. "This can help them understand which areas are in demand during the day and night and why: for shopping, eating, being entertained etc. This can help us look at what time of day people need access to certain amenities." Another incidence of this approach being used is evident in Sasaki's plan for New Bedford, a New England town with a working waterfront. By analyzing pedestrian circulation, Sasaki was able to pinpoint areas for potential economic development using data visualization cartographically in the process. Further coverage by AN of that scheme can be seen here. 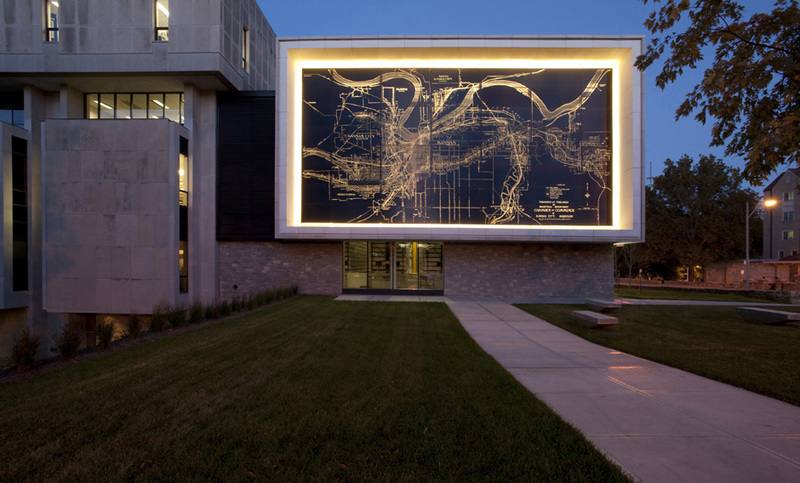 Technology integration, meanwhile, can be found at the University of Missouri–Kansas City Miller Nichols Library, another project on which the Boston-based firm worked. Here, a dense central core of book stacks was moved to a new wing that housed an Automatic Storage and Retrieval System (ASRS). Subsequently, the reduction in square footage (usually required by traditional book stacks) minimized site disturbance and preserved green space. Energy loads for lighting, temperature, and humidity are all reduced in the ASRS compared to the requirements of spaces that integrate shelving with populated study space. Sasaki described the original Miller Nichols Library as a "fortress-like structure typical of the Brutalist architectural style of the 1960s." Retrofitting is an emerging topic in architecture discourse as typologies become redundant in certain respects and new technology comes around. At AN's upcoming Facades+ conference in Boston, this topic will be addressed in a panel on modernist performance retrofitting. Another panel, meanwhile, will look at how urban data is informing facade design. Barnett will be on hand at the event to act as a panel moderator. The event's co-chair is Senior Associate at Sasaki, Brad Prestbo. Prestbo is also a co-founder of MakeTank!, an upcoming program at the Boston Society of Architects (BSA) that looks how technology is changing the way architects make and build. MakeTank! aims to engage makers throughout New England and aims to serve architecture studios that do not have access to such [technological] facilities. "It is a group devoted to exploring the frontiers of fabrication and design," Prestbo told AN. To find out more about the Facades+ Boston conference and register, visit facadesplus.com. Seating is limited.